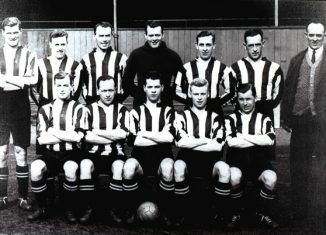 The team’s strength was founded on the goal-scoring ability of Harry Beadles and a very settled defence in which Edwin Worrall, signed from New Brighton, and “Topping” Sinclair were ever-present, whilst ”Salty” Haisall was frequently at his ,brilliant best. In fact, the same defence—Halsall, Worrall, Devine. Saxton. Martin and Sinclair-saw duty in 30 of the 46 League and Cup games. Once again though. it was in the F.A. Cup that Southport really shone. was the snap of their attack and; their rock-like defence, with Halsall a marvel in goal, that pulled Southport through, despite losing outside-right Shaw early on with a broken collarbone. Halsall-in his 350th first-team game—played like one inspired and at the final whistle he received a wonderful ovation from the Yorkshire crowd. After losing their three previous League games, Southport progressed to Round Four by defeating Second D:vision Fulham at Haig Avenue. They achieved their 3-0 win with little difficulty: a Fulham defender scored an “own goal” in trying to divert a Beadles shot, and Tait added two more in the second half. Short of cash, as ever, ‘Southport got out of difficulties by resorting to transfers. On March 7th they sold Tommy Tait to Manchester City’ for a then record fee for the club. Only nineteen, Tait had joined Southport from Middlesbrough the previous October, and scored 15 League and Cup goals in only 19 outings. They had to pay a quarter of the fee to Middlesbrough but, even so, they made about £2.000 on the deal. They followed this up by transferring Harry Marshall to Wolverhampton Wanderers. Marshall, signed two years previously from Nottingham Forest, had scored 15 goals in all, and impressed many clubs with his ball play. Ail this helped push the profits over £550, thereby reducing the overall deficit to £2.370.